Augmenting polarization via social media? A comparative analysis of Trump’s and Wilders’ online populist communication and the electorate’s interpretations surrounding the elections. 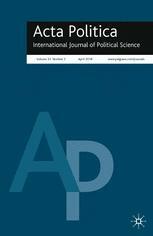 New publication by Michael Hameleers in Acta Politica, titled “Augmenting polarization via social media? A comparative analysis of Trump’s and Wilders’ online populist communication and the electorate’s interpretations surrounding the elections”. Read the article here. Abstract: Social network sites may have contributed to the global electoral success of populism in important ways. Drawing on the technological affordances of social media, politicians are enabled to directly communicate populist discourse via Twitter by constructing a pervasive societal divide between the “good” people and “corrupt” elites. Such Tweets may resonate with the reality constructions of receivers—who are also enabled to communicate populist discourse online. To understand the intersections of the supply- and demand-sides of populist discourse in the U.S. and Europe, this paper draws on extensive comparative qualitative content analyses of Trump’s and Wilders’ Tweets (N = 2681) and the electorates’ discourse on Facebook (N = 657). The results provide important insights into the mechanisms of inclusion and exclusion at play in populist discourse and the affordances of social media in shaping populist and polarized discourse among politicians and the electorate at election times. ← Online and Newsworthy: Have Online Sources Changed Journalism?